Atheism not only disregards the existence of deities, but it also encourages people to seek pragmatic answers and question blind belief. Atheism is indeed a vast subject that most people do not understand and thus atheists happen to be persecuted very often by those who consider themselves religious. However, if you identify as an atheist, then there is a lot that you can do to show support to fellow non-believers or spread awareness amongst those who take an interest in ideas that are humanitarian and secular. At Atheist Republic, we have an extensive gallery of gifts and products where you can find items ranging from coffee mugs to key chains. On these products, we have fascinating quotes and intriguing symbols related to atheism – simple illustrations that will allow you to express yourself and perhaps enlighten those around you. You could also exchange these atheist gifts with like-minded individuals to show solidarity and support. Imagine meeting an atheist friend for coffee and both of you sipping from mugs that say something about atheism! In fact, our gift items are not necessarily restricted to atheists and non-believers. You could also gift a product with a subtle message to a devout person or someone who does not really have an opinion. For all you know, your gift would actually evoke curiosity in others’ minds and they would find themselves learning more about atheism than you initially thought they would want to. 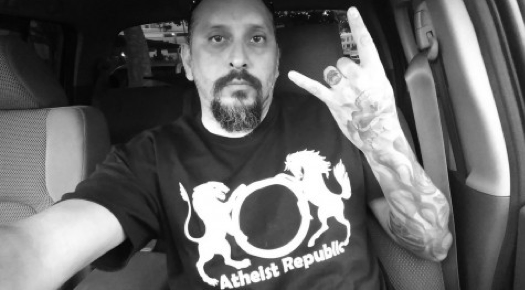 Atheist Republic’s assortment of gifts and products are varied and while you could indulge in them yourself, it may be a great idea to share them with other people as well. Customize products you like with your preferred fonts and colours and if you have an innovative idea, feel free to share it with us so we could add it to our exclusive gallery of gifts and products.